If an item is deleted from Sitecore, then it will be moved automatically to Recycle Bin similar to the Windows operation system. So when an item is deleted accidentally, then you could get that item restored from the Recycle bin as mentioned in the below steps..
First, we need to login to Sitecore in desktop mode and the click on Sitecore start button and then select ‘Recyle bin’. Then a dialogue will be opened with list of deleted items. Select the item which you want to restore and click on restore button at the top left. That's it. This will restore the deleted item back to its original location. Some times you might delete an item accidentally, and later you realise that the item is deleted. 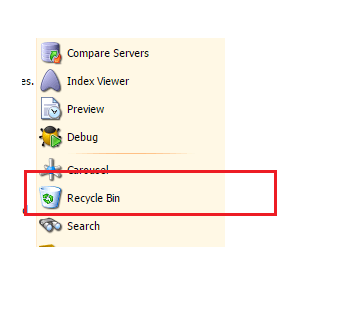 If the recycle Bin is not emptied then you can restore i t from there, but what if the Recycle Bin is also emptied? Cant we get that item back? The answer is Yes but only in some situations. If the item is deleted in one database (say master) but you have already published that to web database before deleting, then you could restore it from web database. To restore you need to use the Transfer option present in Sitecore. So transfer the item from production(web database) to master database. Follow the below steps to do the same. Open Sitecore content editor in web database. Right click on the item which you want to restore and click on Transfer. Then select the destination database as master(or which ever db where you want it to be restored) and then click on Transfer option. Or to check differences between options to move items in sitecore, then go through this post – Sitecore publish vs transfer – which to use when and how? Have some better options than these? Then please don’t forget to comment. !